LOVE this, and I will be making more. Only thing I did not take careful enough notes on is how long it takes to reduce – I believe it was about 20 minutes, but i would want to field test that again. Your mileage may vary. Enjoy! The first cranberries of fall and the last plums of summer come together into one delicious, spreadable fruit fiesta that’s as pretty to look at as it is delicious. This is at home on a number of dishes – sandwiched between cookies, spread on breakfast toast, or alongside savory roasted poultry. In a wide, heavy-bottomed Dutch oven, combine the plums (whole), the cranberries, and apples (after they’re peeled, cored, and roughly chopped). Add the water, cover, and place over medium-high heat until it begins to boil.Lower to a simmer and stir occasionally; cook until the berries and plums burst from their skins – about 30 minutes. Let cool slightly and pour the fruit and all of the liquid into a sieve over a large bowl.Stir and press hard on the fruit until all of the liquid and pulp have been rendered.Discard the remaining pulp and pits. Pour the fruit sauce back into the pot and add the sugar, salt, and black pepper. Stir to combine, and cook over medium heat to reduce and thicken for about 20 minutes, stirring often.Lower the heat as needed to prevent splatters and to keep the fruit from sticking. Once the butter is thick enough to part when streaked with a spoon across the bottom of the pot, remove from heat. 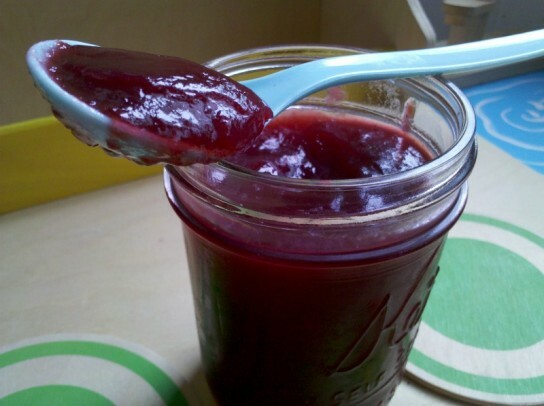 Ladle into clean jars (or if canning, sterilized jars with a new lid).Eat warm or refrigerate; this will keep at least two months.If canning, process for 10 minutes in a hot water bath and keep up to one year.